Sidewalks Bath. Made of aluminum corrosion. 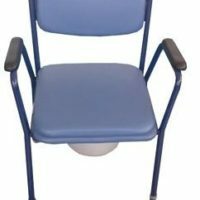 Seat with smooth surface for comfort. 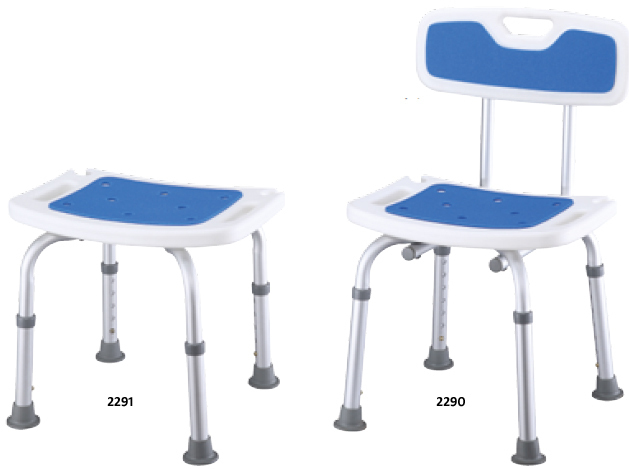 Height adjustable Size: 39 x 39 x 36-46 cm. 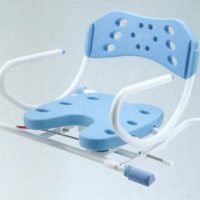 Bath Shower Stool, large seats with side handle grips. 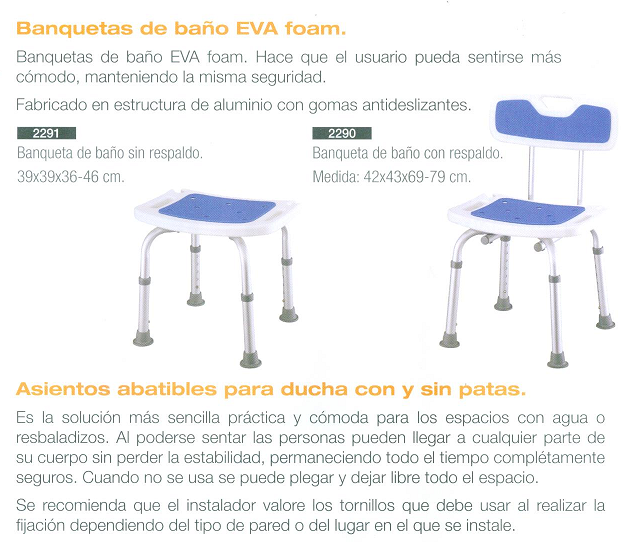 The design of its structure of the technical aid product with it´s curved legs and large distance from one another, make bathroom and shower stools EVA especially robust and ready for users with stability problems or muscle problems in the legs that prevent a gentle descent. 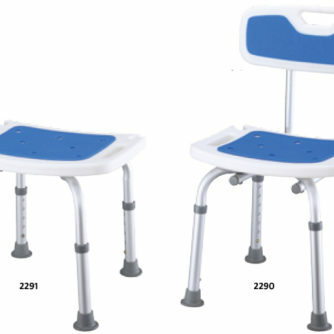 Its height can be adjusted to suit the needs of each user. 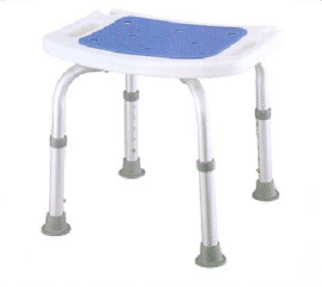 The legs have non-slip rubber ferrules wide base. 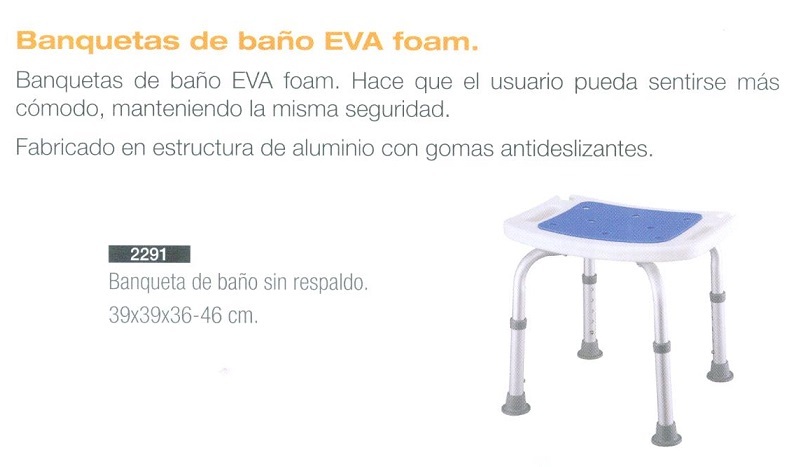 The EVA Foam bath and shower stools are made of aluminum. 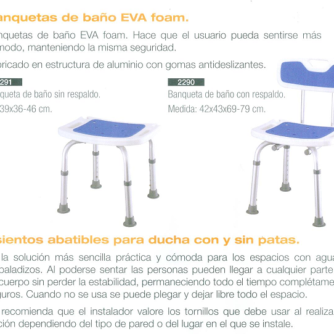 Seat with smooth surface for comfort. Size: 39 x 39 x 36-46 cm. If you are caring for the elderly, help with bathing and higiene it is important to prevent infection and diseases. 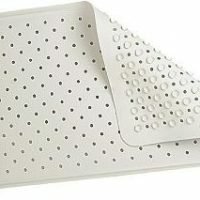 The ideal shower consists of a non-slip surface at the same ground level, with insulation for water and a drain; thus completely it eliminated the access barrier to it. 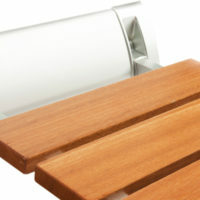 These non-slip floors offer greater safety in preventing accidents slip any shower or bath taking precautions. Check that the water temperature is adequate. Not going to be scorching, or conversely, the water is very cold and feel unpleasant and then catch a cold. 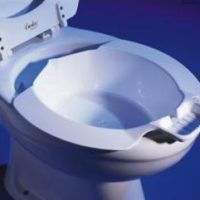 Never leave the sick in the bathroom, could fall, slip or suffer an accident. Do not be at hand electrical appliances that might cause an accident. 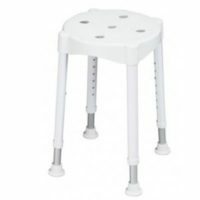 Bathroom stool MILANO height adjustable and removable without tools. 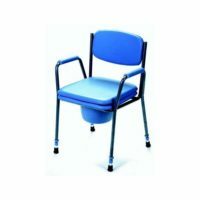 Toilet Chair : Chair discreet and comfortable room with toilet, with cover to hide.